Her name is Mayssa Abdo and she has set social media abuzz for her role defending the Syrian border town of Kobane against invading Islamic fighters. As is the custom for Kurdish fighters, Mayssa, 40, uses a pseudonym. She is commanding the Kurdish People’s Protection Units in Kobane along with Mahmud Barkhodan, according to Syrian Observatory for Human Rights head Rami Abdel Rahman. The YPG group has been defending Kobane, on the border with Turkey, since Islamic State in Iraq and Syria fighters launched an assault on September 16. 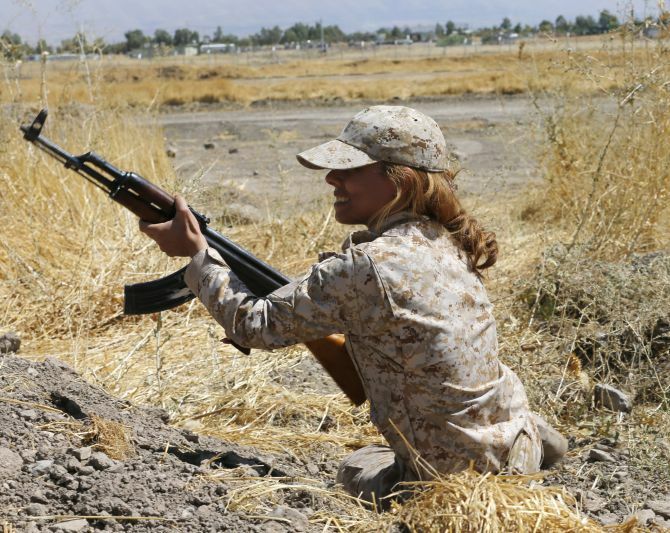 Women traditionally form a major part of Kurdish fighting forces, and they are well represented among Kurdish forces in neighbouring Turkey and Iraq. On October 5, young Kurdish woman fighter Dilar Gencxemis, identified by the YPG by the nom-de-guerre of Arin Mirkan, blew herself up outside Kobane in an attack which reportedly killed dozens of ISIS militants. Women 'unfit' for fighter jets. Is IAF chief's remark sexist?